This post originally appeared on the website Eat Sleep Write in 2015. Please pre-order and support the Young Explorer's Adventure Guide via Kickstarter here. In this world of racial tensions that never seem to stop escalating, perhaps one positive step toward peaceful coexistence is to open the minds of the next generation. The children’s literature scene is taking this idea seriously. Publishers and writers are stepping up and speaking out to encourage diversity in kid lit. While a number of children’s publishers are attempting to be more racially diverse in their offerings, some companies were designed with diversity as their primary goal. British publisher Tamarind (now owned by Random House) has an almost 30-year history of featuring diverse cultures in its children’s books. In the U.S., Lee & Low is at the forefront of publishing with a non-white perspective. You can read Lee & Low’s mission statement here. Writing about diverse cultures is not the same as representing them personally. Another side of diversity in children’s publishing is the encouragement of diverse ownership of publishing companies. To highlight this issue, the Cooperative Children’s Book Center has put together a list of small presses that publish for children and are owned by people of color. Rainbow Rumpus is the world‘s only online literary magazine for children and youth with lesbian, gay, bisexual, and transgender (LGBT) parents. We publish short stories, illustrations, articles, celebrity interviews and profiles of the children of LGBT parents with the goal of showing young readers a world in which having an LGBT parent or parents is no different than any other. We serve our audience with high-quality writing and artwork which is often used in the classroom as well. The key phrase here, I think, is “no different than any other.” If we welcome enough diversity into children’s lit, then perhaps children will grow up realizing that every culture is equally valid. Dreaming Robot Press believes representation matters. Children must be able to envision themselves as the heroes of any story. 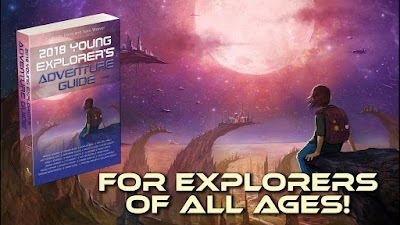 The Young Explorer's Adventure Guides are science fiction anthologies geared to the middle grade reader. Girls, boys, people of all skin tones and ableness are the heroes here! I hope these words inspire you to add diversity to your own writing for children. Here’s an essay for those who want to create a more inclusive setting and characters but don’t know how to begin. Next time: Diversity in YA lit.